Las Vegas police said that at least 58 people have died and 515 are injured from the shooting. Authorities continue to investigate what motivated the man they say opened fire on concert-goers as victims' identities continue to come to light over a day after the attack. During a press conference on Tuesday afternoon, Nevada officials said they have identified all but three victims of the shooting, but still offered no information on potential motives. A gunman opened fire from a hotel room above a packed, outdoor concert in Las Vegas early Sunday morning, killing at least 59, wounding 527 more and prompting chaos as the panicked crowd scrambled for cover amid the deadliest mass shooting in modern U.S. history. Gunman Stephen Paddock, 64, was found dead by officers who stormed his 32nd-floor room at the Mandalay Bay Resort and Casino, said Clark County Sheriff Joe Lombardo, who announced the death toll and said it could rise. Lombardo described Paddock, of Mesquite, Nev., as "a distraught person intent on causing mass casualties." Lombardo said Paddock was likely a "lone wolf" and that a motive for the shooting had not been determined. 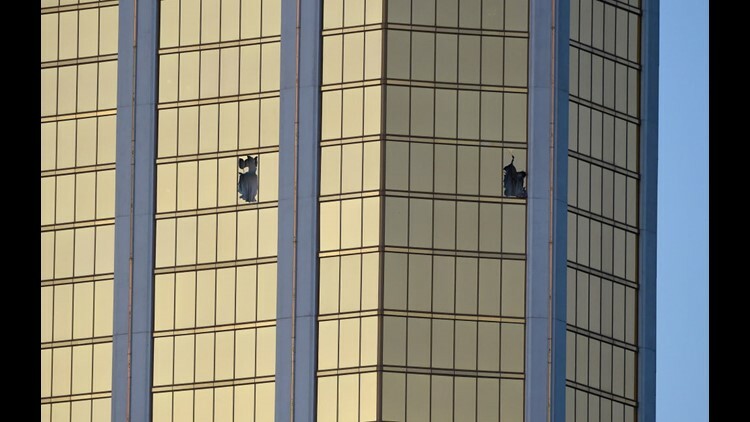 LAS VEGAS, NV - OCTOBER 02: Broken windows are seen on the 32nd floor of the Mandalay Bay Resort and Casino after a lone gunman opened fired on the Route 91 Harvest country music festival on October 2, 2017 in Las Vegas, Nevada. At least 23 weapons, many of them rifles, were found inside Paddock’s hotel room, officials announced Monday. The ATF recovered a total of 47 guns owned by Paddock, including those recovered at his home. The official, who has been briefed on the matter but is not authorized to comment publicly, said that police also found two tri-pods positioned at the hotel windows in what appeared to be a fully-equipped sniper’s nest to take better aim at the crowd below. Authorities believe that the gunman, who had no serious criminal background, purchased many of the weapons legally. The ATF also announced Tuesday the shooter had devices attached to 12 weapons allowing semiautomatic rifles to mimic fully automatic gunfire. Lombardo said authorities also searched Paddock's home and found even more weapons — 18 firearms, explosives, and unidentified electronic devices, as well as thousands of rounds of ammunition. Officials also said Tuesday they found cameras inside and outside his hotel room-- one of them in a food service cart. Lombardo said authorities had searched Paddock's home and found more guns and ammunition. Paddock's brother, Eric, who lives in East Orlando, Fla., said that to his knowledge, his brother had no history of mental illness or substance abuse. He said his brother had "nothing to do" with political or religious organizations. His brother owned guns and played high-stakes video poker, he said.